Apple Strudel is much easier to make from scratch than you think! With its flaky crust and a spiced apple filling, this traditional Apfelstrudel recipe is sure to wow your guests. Serve it with vanilla ice cream or vanilla sauce and you have the most delicious fall and winter dessert that everyone will love! 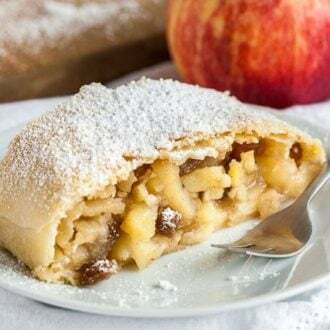 This traditional Apple Strudel Recipe is made with a simple dough that bakes up into a flaky, buttery crust and a juicy, spiced apple filling studded with rum-soaked raisins and finely chopped almonds. An impressive dessert that’s perfect for special occasions and the holiday season! I love to serve this Apfelstrudel warm topped with vanilla ice cream or homemade vanilla sauce. It’s one of my favorite desserts during fall and winter! Making the dough from scratch might be intimidating but it’s actually easier than it seems. 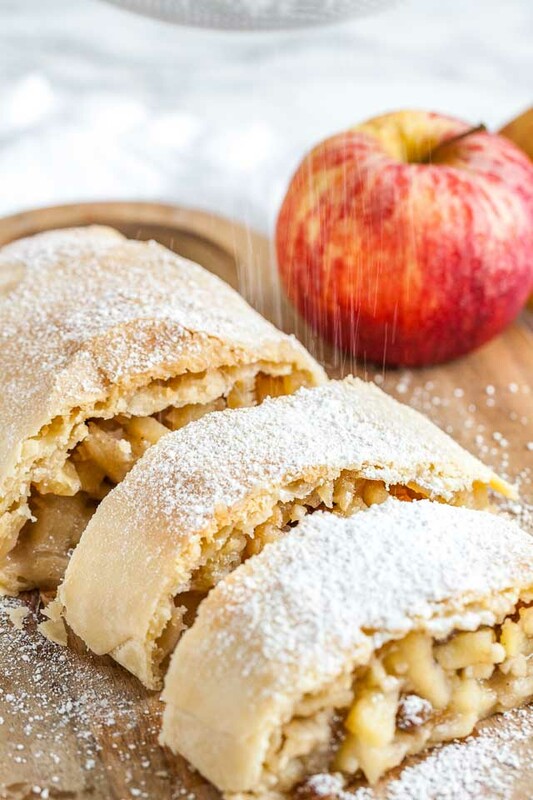 I went through a few fails to make this recipe as foolproof as possible for you and I’ll share all my tips and tricks to make a traditional German Apple Strudel at home that tastes like the one you’ve tried on vacation! Did you know that Apple Strudel is not really a German pastry? 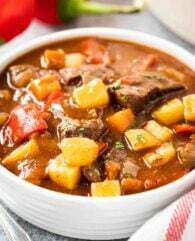 It originated in Austria and is popular in many countries in Europe that once belonged to the Austro-Hungarian Empire. Germany wasn’t part of this empire but many popular Austrian dishes like Kaiserschmarrn or Apfelstrudel are also part of the Bavarian cuisine because of the proximity to Austria. What type of pastry is used for strudel? 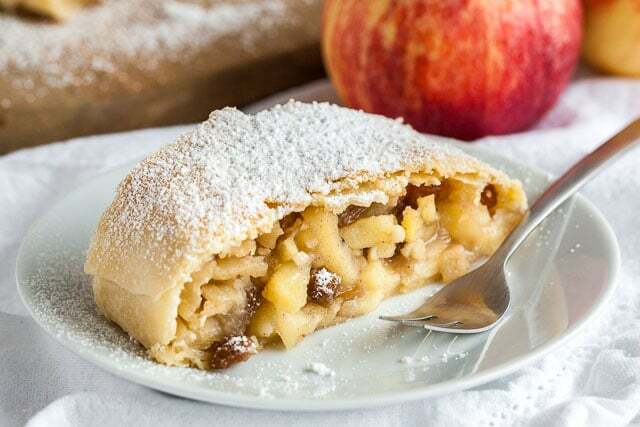 Traditional Viennese Apple Strudel is made with strudel dough. A soft dough made with only a handful of ingredients that’s hand-stretched into a paper-thin sheet the size of a tabletop. But many are afraid of making a strudel dough, so recipes these days often cheat by using sheets of purchased phyllo dough or puff pastry. I think if you want to make traditional Apple strudel you should give the strudel dough a try! It really is easier than you think and by not aiming for a paper-thin dough you will be rewarded with a delicious strudel that is easier to make than the Austrian Grandmother version but not less delicious. Start with making the dough. This dough recipe is pretty straightforward. 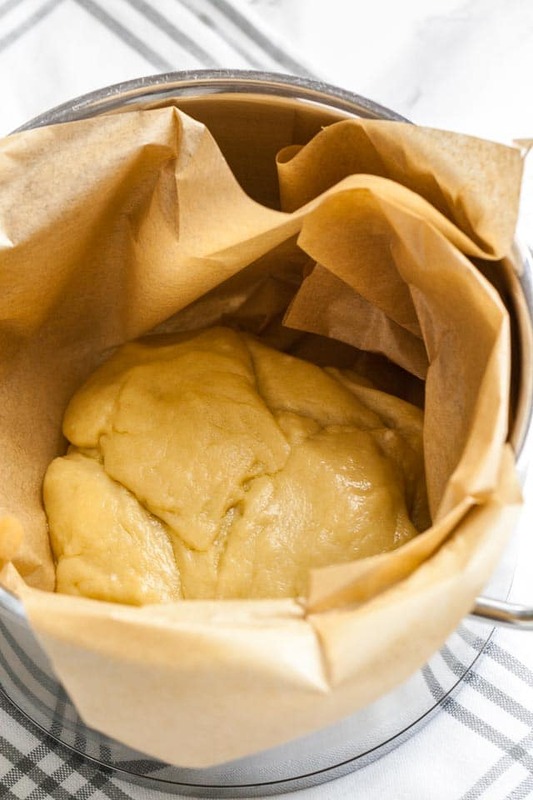 Melted butter, flour, lukewarm water, and a little bit of salt are combined until a smooth dough forms. I use my Kitchen Aid for making the dough and it does the job in less than a minute. Now comes a step that will make stretching the dough so much easier. Let the dough rest in a hot small pot covered with a lid. This makes the dough elastic and easier to handle. While the dough is resting make the apple filling. You want it to be ready before you start rolling out and stretching the dough because if the dough gets dry it will tear and you might end up with a huge mess. While testing this recipe I nearly had a breakdown because my strudel ripped open in the oven and the apple filling spilled out. Don’t be over ambitious! Yes, Austrian grandmothers can stretch the dough only with their hands paper-thin in less than a minute but none of us is an Austrian Granny. You want to see the pattern of your dish towel through the dough but that’s enough in my opinion. You will get better and faster at this with time but please don’t aim for A+ the first time! 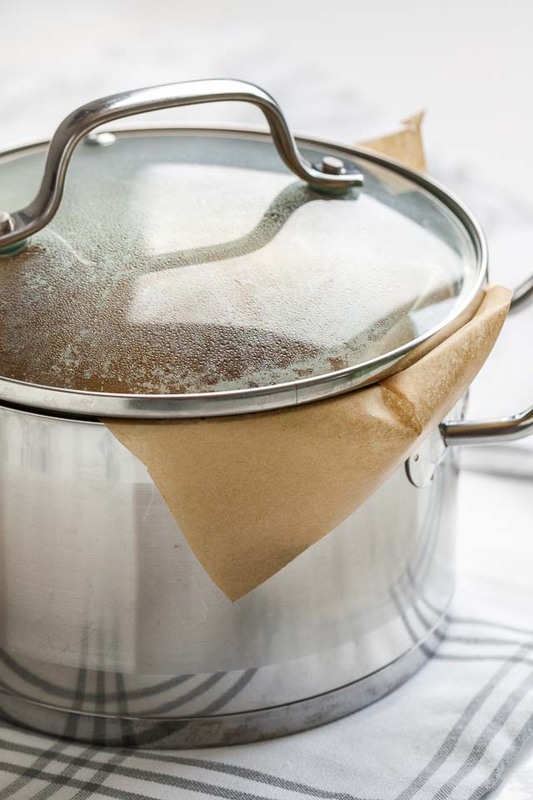 Use a smooth dish towel! I tried it once with a rough towel and the dough stuck to it. Have the apple filling prepared in advance! You don’t want the stretched out dough laying around too long or it will get dry. Remove all your jewelry and push up your sleeves! Rings, bracelets or even your sleeves could ruin your dough. If you follow these tips making the dough is really not that hard! For the apple filling, I prefer to cut the apples into small stripes (batonnets). Some people also like to cut the apples into small slices. Then combine the apple and the other ingredients. 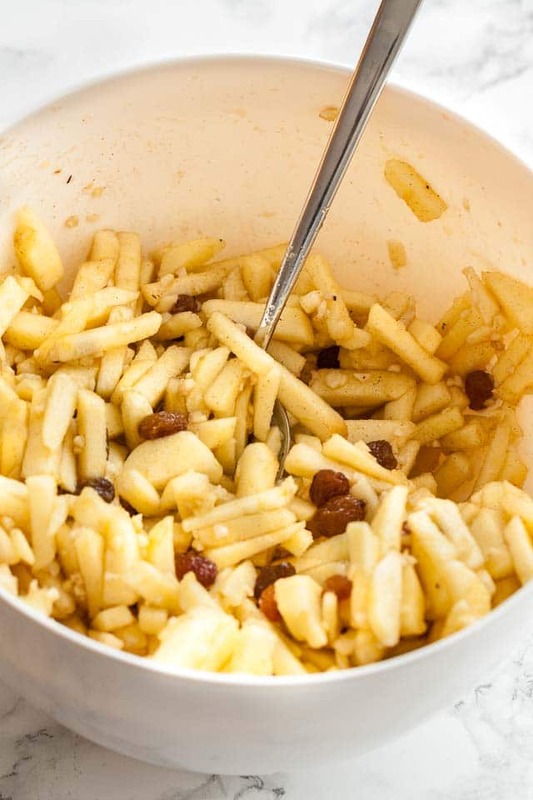 Rum-soaked raisins are essential for making a good apple strudel. Just combine rum and raisins (I like to use golden raisins) and let them sit for about 30 minutes. Then discard (or drink) the rum and add the raisins to the filling. If you can’t use rum you can soak them in lukewarm water or apple juice. The nuts in the filling are optional. I really like them in the filling but only if they are finely chopped. If you find finely chopped blanched almonds at the store use these or finely chop store-bought slivered almonds. There are different ways to spread the apples over the dough. I find the easiest and most foolproof way is to make one stripe of filling, about 6-inches thick. 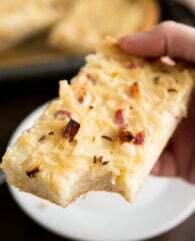 You want to roll up the dough from the short end so with the long side facing you, leave a few inches space on the right side of the rectangle then sprinkle the breadcrumbs top to bottom over the dough in a 6-inch thick line. Leave a 2-inch margin at the top and bottom of the strip. Pile the apple filling on top of the breadcrumbs. To avoid adding too much liquid use a slotted spoon to transfer the filling onto the dough. 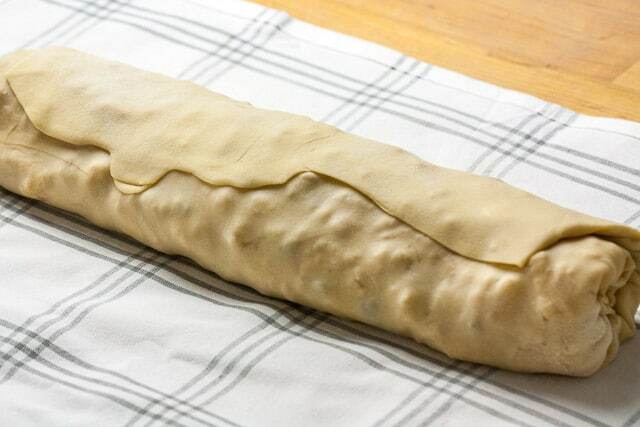 Make a uniform pile and then fold the dough at the top and bottom over onto the filling then roll up the strudel from the short side with the help of the towel. Be careful and work slowly, it’s similar to making a swiss roll. Brush the strudel with a little bit of melted butter, then put it in the oven for 50 minutes. While it’s baking brush it with more melted butter every 20 minutes. Can Apple Strudel be made in advance? I think it tastes best warm from the oven but it also tastes great at room temperature or reheated in the oven for a few minutes. I wouldn’t recommend to assemble the apple strudel in advance and then bake it on the next day because the apples will soak the dough. You can make the dough in advance and store it covered in the fridge overnight, let it come to room temperature before rolling it out. You could also freeze the assembled but not baked apple strudel and then bake it a few minutes longer when you want to serve it. But I haven’t tried this method myself, I’ll update this post if I try it. What to serve with Apple Strudel? Apfelstrudel is always sprinkled with powdered sugar and most of the time served with vanilla sauce. It tastes also great with whipped cream or a big dollop of vanilla ice cream. I love it with ice cream! Vanilla ice cream with warm strudel = HEAVEN! Looking for more traditional German/Austrian dessert recipes? It cores, peels, and slices. Not only does it save tons of time, but it’s MUCH safer than using a paring knife to peel apples or potatoes. 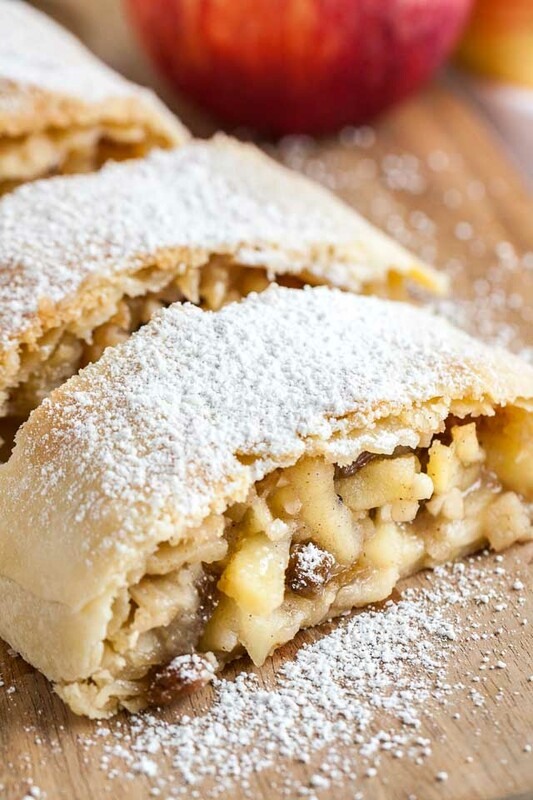 Apple Strudel is much easier to make from scratch than you think and tastes amazing dusted with powdered sugar! 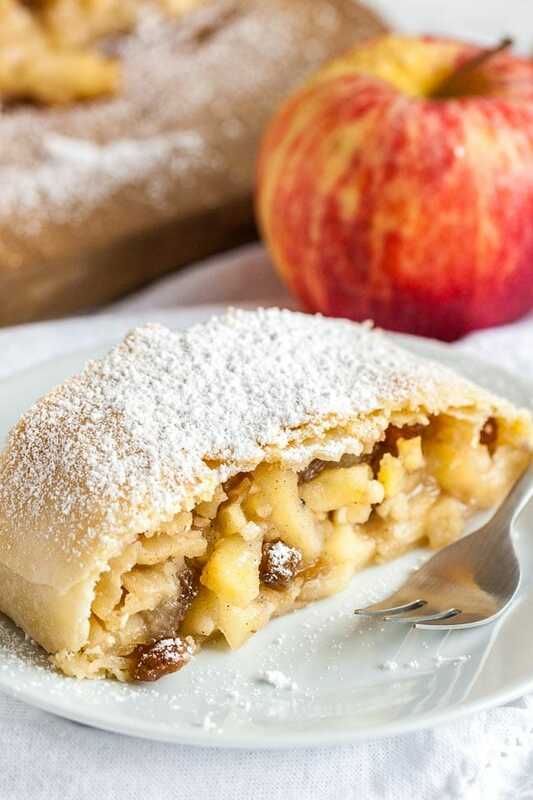 Everyone will love this traditional Apfelstrudel that has a flaky crust and is filled with juicy spiced apples. Your recipe is very close to my Austrian mother’s …..she of course always made her own dough which is not easy as it needs to sit, rise and then stretched out over the entire table being careful not to put any holes in it…almost impossible for me. The tea towel is the only way to go. I slightly dampen it to keep the phyllo from drying out. Do you recommend only 2 sheets of phyllo? I have read some recipes that recommend about 8…I can’t quite perfect this end of things. Not sure what you mean but this recipe doesn’t use phyllo. So I can’t really help, sorry! I was randomly searching for my own FB pics of my own strudel photos of my family’s recipe, and I ran across your recipe and website… I am sooo glad I did! Everything looks so yummy, and I am going to incorporate your steps and tips into mine… :) Thanks for the great ideas! Hello Julia, also my daughter’s name 😊, thank you for posting this recipe. We are looking forward to making it tonight. One question: do you have to use the think towel to roll out the dough or can you use a cheesecloth or floured cutting board or wax paper? 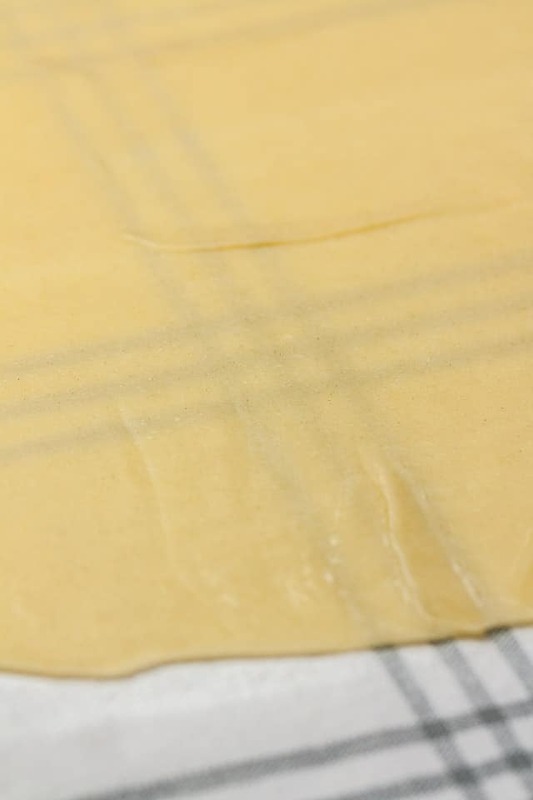 Hi Aaron, the kitchen towel makes it easier to see if the dough is thin enough because you’ll see the pattern through the dough but you can also use a cheesecloth or roll it out on the kitchen counter or a piece of parchment paper. I find the kitchen towel the easiest so that’s why I recommend it but it is not necessary. Merry Christmas! Yes, I recommend using them otherwise it might get soggy because of all the juices from the apples. I’m so glad I found this recipe. It was easy to follow and my strudel came out great. I made a few small mistakes but they are fixable. Forgot to put the seam-side down and I need to let it rest a little longer before cutting. I’ve tried some strudel receipts before (they were more or less successful). But this one I found the best, for sure! Great detailed description, no hidden ingredients, easy to prepare, and really amazing result! Thank you Julia for sharing it! Mine exploded in the oven … did I need to put slits in the dough? Too much air in my roll? I’m hoping your recipe can match up to my grandmother’s and I’d like to give it a try. (My grandmother has long since passed without leaving my parents the ‘famed’ recipe.) 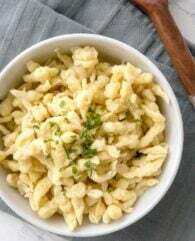 Do you have a video on this recipe? I’d love to see you assemble it. I’m going to make apple strudel for the first time. I’m reading through the recipe and cannot figure out what “breadcrumbs” are. I’m sure it is something simple but i don’t want to make an epic mistake. Thank you in advance. Breadcrumbs are made from dried bread. You can buy breadcrumbs in every supermarket or make your own by pulverizing dry bread in a food processor until it has a sand-like consistency. This really was simple. Thank you for a great blog. Apple Struddle is one of my favorites. I can’t wait to try this recipe! YUMMM, I love the rum raisin addition, making this soon!